Being one of the largest cities and business hubs in the southeast means that the ATL has a little something for everyone. With so many areas within the city that offer their own flavor, apartment finding may be difficult for those just beginning to relocate. Here is a sampling of what living here has to offer. The area’s major businesses are household names, but chances are that you would not expect companies such as The Coca-Cola Company and The Turner Broadcasting System Inc. which makes up CNN, Cartoon Network, and TNT, are all headquartered here. As for up-and-coming businesses within the metro area, a handful of companies made it onto Inc.’s top 5000 fastest growing companies that spanned sectors relating to health, tech and government services. Looking towards the neighborhoods between Grant Park, Glenwood Park and Ormewood Park, are a good start for professionals and families looking for family-friendly areas that are also central. This area has a slower-pace to it, encouraged by Grant Park’s massive presence and the old craftsman-style homes, bungalows, tree-lined streets and old oaks. With plenty of recreational opportunities such as basketball courts and soccer fields and rolling grassy hills to picnic on and play at Grant Park, there is much to do for children. Also, the Zoo, Parkside Elementary School and Maynard Holbrook Jackson High School, are right in the neighborhood as well. Due to the combination of townhomes, and single family homes for rent, Grant Park is a great option for those moving to the area that want options within a highly reviewed area that is still central. 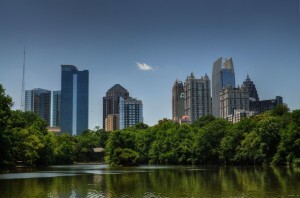 Buckhead is another community that is worth considering. Buckhead has seen some serious development within its community and is one of the largest business districts in the city. This has resulted in some of the best shopping centers such as Phipps Plaza and the Lenox Square Mall and a lively nightlife scene with a diverse selection of restaurants. Also, with many highly-rated private schools in the area such as the Westminster Schools and The Lovett School and a solid public school system. Living can be very affordable in this area, so looking for cheap apartments with utilities included is a viable option, however those looking for nicer options will be able to find luxury living throughout the urban and residential areas of Buckhead. Midtown is another community that offers many unique amenities and opportunities for residents when compared to other Atlanta apartments for rent. Being the second largest business district and with its close proximity to Downtown, Midtown attracts a large number of professionals, young and old. Midtown is sandwiched between Georgia Tech and Piedmont Park, thus offering a very convenient location for students and offering the amenities of pet-friendly Piedmont Park, the largest park in the city. Also, the commute to Downtown is very easy, thus midtown makes a good option for Georgia State University students as well. Also, Midtown arguably has the best art scene in city, and hosts the Arts Festival as well as a few other festivals such as the Dogwood Festival, and Music Midtown. Living opportunities range from refurbished warehouses that have been turned into upscale, industrial condos for rent, high-rise luxury and studios, and spare rooms in houses for rent. Some other highly rated areas include communities such as Acworth, nicknamed Lake City due to its close proximity to Lake Allatoona and Lake Acworth. Also, about twenty-five miles outside of town, you will find Flowery Branch which is perfect for those looking for a historic small-town atmosphere uncommon amongst many of the city’s communities. The climate is on the moderate side. Winters can sometimes dip below the 40s during the nights, but the days range from the mid-40s to 60s. The summers, on the other hand, exceed the 90s and are considered hot by the locals. Searching for a place with all your bills paid with rent and a nice pool area tend to be good ideas in terms of comfort and cost. Also, using the right guide yields better and more accurate results than Craigslist. Besides the typical listings, renters may also be interested in townhouse style living in the area. Filter searches by townhomes / townhouses.